Do you want to have the most amazing Italian vacation possible? Italy is filled with so many great cities to visit, amazing sights to see, wonderful restaurants to sample, that it can be difficult to decide where to go and what to do. That’s where Open Road’s Best of Italy comes in. The author has lived in Italy for almost 10 years, knows the country like a native, understands what travelers need, and has collected the best of everything in an easy-to-use format. 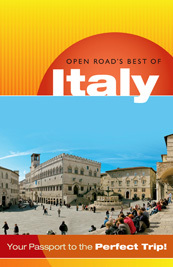 So if you’re looking for stunning architecture, unparalleled artwork, dazzling museums, ancient ruins, magical hill towns, world-class accommodations, relaxing cafes, seaside resorts, incredible eateries, vibrant community life, and all manner of outdoor activities, Open Road’s Best of Italy is the guide for you! With this book, your days and nights in Italy will be filled with all the exciting possibilities the land of La Dolce Vita has to offer, serving up the best parks, piazzas, shopping areas, local neighborhoods, and more, to help take the guess work out of creating the perfect vacation for your particular needs. It‘s easy to see why so many people choose to visit the boot-shaped peninsula that juts into the Mediterranean. From the big tourist cities of Rome, Florence, and Venice to historic hill towns such as Perugia, Ravello and Lucca, small mountain villages like Gubbio or Todi, as well as breathtaking coastal towns, Italy is romantic, beautiful, fun and exciting.